HONG KONG – July 22, 2011 – Never compromise individuality with the new Android™ smartphone from Motorola Mobility, Hong Kong, Ltd, the Motorola XT316. The fashionable Motorola XT316 offers a full QWERTY keyboard with a 2.8 inch touchscreen display to allow the ultimate personalization options users expect from the fun and versatile Android™ platform. The device will be available in Hong Kong starting on July 22 for $1,688. Motorola XT316 has a sleek, modern design and a sophisticated finish. Its full QWERTY keyboard and 2.8-inch touchscreen display provide the perfect combination of tools for emailing, texting and browsing the Web all day long. Users can even personalize their device and stay in constant contact with friends and families through the world’s leading social media applications. And, Motorola XT316 transitions seamlessly between work and play, with a friends-centric widget to make it easier to manage contacts for both. Motorola XT316 also comes with a best-in-class battery. The battery can handle Web browsing, playing videos from the Web or heavy messaging all day long. Motorola XT316 also has the Moto Switch user interface, which allows users to switch into a more friends-centric mode when they head home for the day. 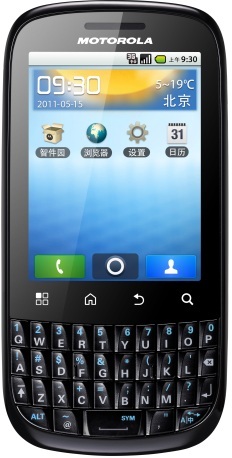 Motorola XT316 will be available on July 22 for HK$1,688. For more information and a full list of Motorola XT316 features, visit motorola.com/Consumers/HK-ZH/Home.